Nationally Life Expectancy had been going up consistently over the last 15 years. However, this appears to have levelled off in recent years: Female Life Expectancy has been 83.1 years between 2012-14 and 2014-16 and Male Life Expectancy has been 79.5 years for both 2013-15 and 2014-16 periods. 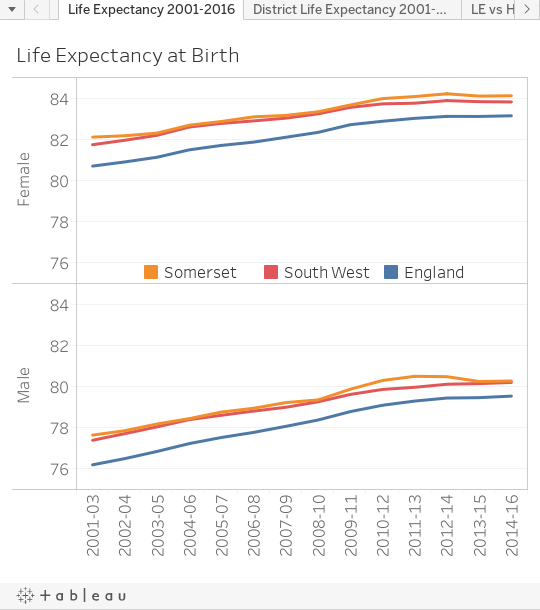 In Somerset, Life Expectancy has followed the same general pattern. However, Life Expectancy for both males and females has been slightly lower in 2013-15 and 2014-16 than it was at the highest point between 2011-13 and 2012-14. Women have a higher life expectancy than men but disability free and healthy life expectancies are similar for both sexes therefore women are likely to spend more of their life in poorer health. Life expectancy at birth is defined as the number of years a person living in an area could be expected to survive if they were to experience that area’s mortality rates (for all people) for the rest of their life. Life expectancy is often calculated using three or five year rolling averages to eliminate any effects of unusually large or small numbers of deaths in any one year. In the past 15 years, life expectancy at birth in Somerset has increased by around two years. Latest data indicates that a male born in Somerset between 2014 and 2016 can expect to live 80.3 years (+-0.3yrs). A female born at the same time can expect to live to 84.1 years (+-0.3yrs). Life expectancies for both males and females in Somerset are around a year higher than national averages. Life expectancy across England is 79.5 years for males and 83.1 years for females. The gap between male and female life expectancy is closing. In the last decade in Somerset it has declined from 4.1 years (in 2003-05) to 3.8 years (in 2014-16). Though it had dropped to 3.5 years for the 2011-2013 period. Life expectancies for the 5 Districts vary by about 1.4 years for men and 0.8 years for women. West Somerset has the highest life expectancy for men while South Somerset is highest for women. Source: Primary Care Mortality Database copyright © 2017, re-used with the permission of The Health & Social Care Information Centre. All rights reserved. ONS mid-year small area population estimates 2014-2016. Public Health England have produced a Segment Tool which provides information on life expectancy and the causes of death that are driving inequalities in life expectancy at national, regional and local area levels. Targeting the causes of death which contribute most to the life expectancy gap should have the biggest impact on reducing inequalities. A summary report for each local authority showing the charts and tables can be downloaded (in PDF format). Revisions made to the way data about disability is captured mean that values before, after and including 2013 should not be directly compared. In effect the latest data (2014-2016) should be treated in isolation until newer data are published. This is largely due to a greater emphasis on mental health with mental health conditions explicitly mentioned in the relevant survey since April 2013. In Somerset, though women have a higher life expectancy, the healthy and disability free life expectancies are relatively similar between the sexes.